What does one usually find when rummaging through an old closet or baul? Most people find skeletons amongst the old stuff. Me, I find something way too cool for words. A few years ago, I decided to resurrect my Lola’s baul, which I inherited when she passed away in 1993. I had been lugging it around through all our moves since then and never found any time nor interest in examining the contents till I had the genius idea of converting the old treasure chest into a coffee table. Amidst her old designer ternos, antique photos, unused brand new bed sheets and towels (all yellow with age, of course), a collection of buttons in a bottle and a whole bag of costume jewelry, was an old folder of a compilation of recipes that she had collected spanning maybe the last 60 years of her life. Looking through her recipes brought me back to simpler and carefree days when 3 generations of Jose-Nievera women worked happily hand in hand in my Lola’s kitchen, wrapping meatballs in molo wrappers to make her famous Pancit Molo for a family gathering. It had to be wrapped just the right way and my Lola never tired of teaching my Mom and I the proper and most efficient technique. Or making her family hit, Hubad na lumpiang singkamas, or special Maja Blanca. Old recipes of her Pinakbet, (pronounced in that hard distinctive Ilocano accent, pee-nuk-booot) with bagnet and Diningding, in her difficult to decipher chicken scratch handwriting, made me so nostalgic for the good old summers in the cool mountains that was Baguio. It is so refreshing then to compare notes with a kindred foodie spirit in the person of Chef Neil Ramos, the man behind Neil’s kitchen. 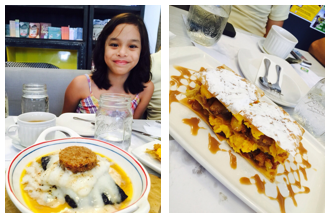 Alabang’s not so well kept secret that is emerging from the comfort food closet. The amiable and smiley-faced Neil, together with bubbly wife Michelle, opened Neil’s kitchen just early this year to complement their very successful catering business of several years operating from their own kitchen at home. Growing up in a family where lots of fond memories revolved around food, Neil has put his little twists and interesting turns to old family recipes that he grew up with, to make them his very own. His unique presentation reflects the way he likes to combine food on his own plate as well as the origin of the way it was cooked. Thus, the signature dish of the house, the Sinigang Paella is cooked in the original Spanish paella way and combined with grilled pork belly cubes on the side, the way Neil himself would eat it. The Crab Cake Torta in shells is served with Crab Aligue Pasta, which makes it a delightful combination. 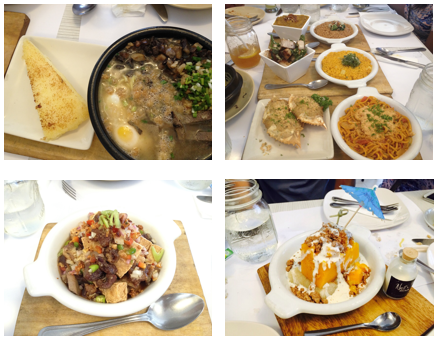 My personal favorite is the very flavorful Ayala Alabang “AA” batchoy with a slice of puto on the side. It is rich in pieces of meat, which would make it a carnivore’s dream. And of course, the happy ending! What proper meal can be complete without the sweet stuff? The dessert trio that was served to my family was the perfect end to our scrumptious meal. Familiar yet new to our palates, Filipino staples like turon, puto bungbong, suman and manga were made all the more interesting and delectable with the addition of chocnut and buco jelly among other sweet surprises. Really a perfect finale with a cup of barako coffee. The building and interiors are worth mentioning too. The white, shining, shimmering, splendid building with the blue skies of Alabang as the backdrop that houses Neil’s Kitchen is pretty hard to miss. The quirky yellow and black door with a bicycle leaning on the wall, sweetly invites you in. The same yellow, black and white motif continues inside and gives one a modern yet comforting feel. All the little touches around the place make you want to linger and stay and just live there. 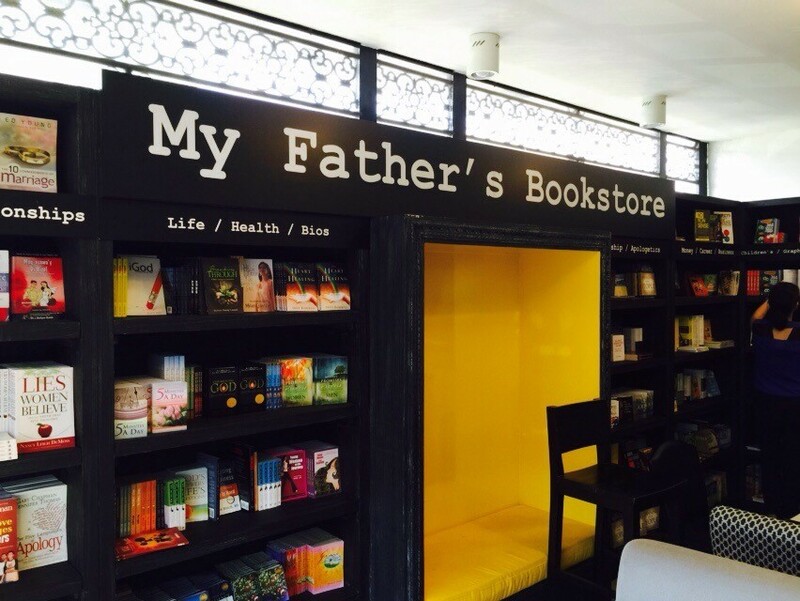 There is a little bookstore in the back, My Father’s Bookstore, where you can comfortably have your meal or have a cup of coffee, read the books and purchase if you want. 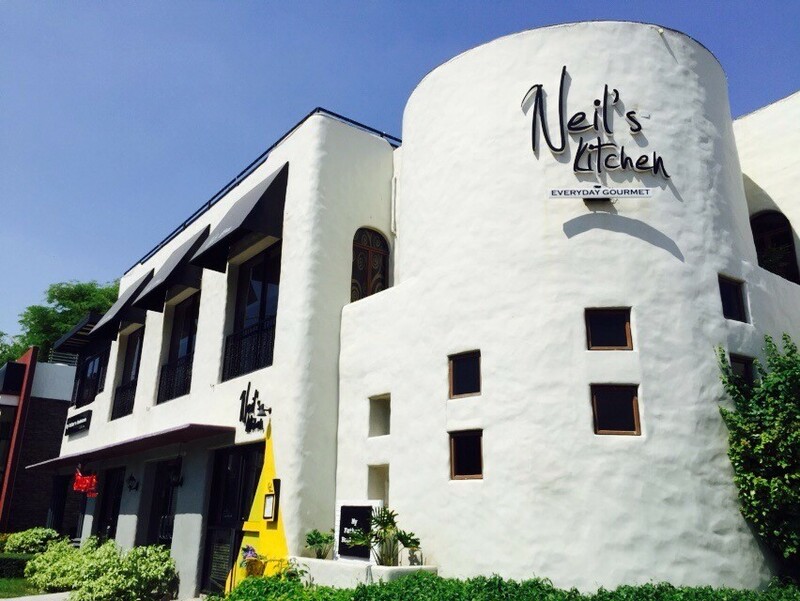 The friendly and homey atmosphere at Neil’s kitchen makes it the perfect gathering place for family and friends. 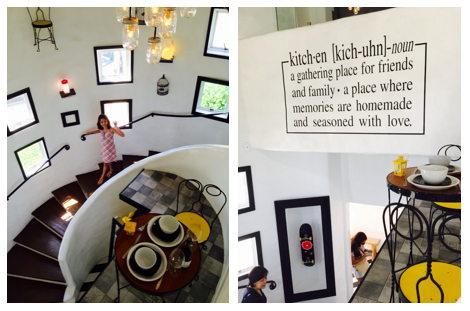 Do drop by anytime you are in the Alabang area and be ready to never want to leave. Neil’s Kitchen is at Westgate Alabang and open everyday from 11am. 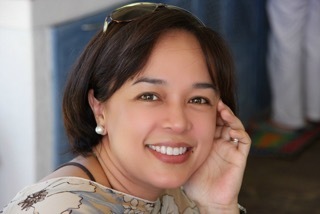 Lizette Barretto Gueco is a regular columnist atFoodFindsAsia.com. 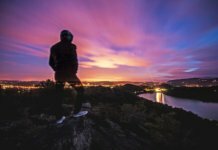 She writes about her life’s passions which are family, home, food, relationships and how they fit in perfectly in her scheme of things and in the circle of life.